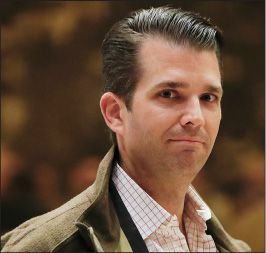 Don Jr. didn’t always want to please his father, said Gwenda Blair in Politico.com. When the elder Trump made tabloid headlines by leaving the then-12-year-old boy’s mother, Ivana, for Marla Maples in 1990, a distraught Don Jr. refused to speak to his father for a year. “You don’t love us! You just love your money!” he reportedly yelled at Trump. Later, while attending the University of Pennsylvania’s Wharton College, said Barbara Demick in LATimes.com, Don Jr. was frequently drunk and openly “despised” his father, his friends from the time say. During one visit, the elder Trump—enraged that his son wasn’t wearing a suit—“slapped him in the face,” a former classmate says. After graduating, Don Jr. got sober, joined the family business, and quickly rose to be executive vice president—though he “never stepped out of the shadow” of Trump’s glamorous favorite child, Ivanka.